After eleven years on the staff at NEHGS, I finally had to face the fact that I had never investigated my own family history. Colleagues had urged me to undertake my own genealogy, and I always said I would, absolutely . . . some day in the future. And so it went, year after year — my ancestry was always something I’d trace later, when I had more time, when things calmed down a little at work and at home, when I could really dedicate myself to it. As any of us who’ve made that “when things calm down” promise to ourselves know, things never calm down. Finally it was a series of questions from my six-year-old daughter that made me take action. At dinner last month, she began asking about our family. “Where were your parents from? What about their parents?” I answered as best I could, distracted by my two-year-old, who likes to surprise us with flying food when we least expect it. “My parents were both from Massachusetts. My father’s parents are also from Massachusetts, and my mother’s parents are from Prince Edward Island.” “But what about their parents? Where are they from? 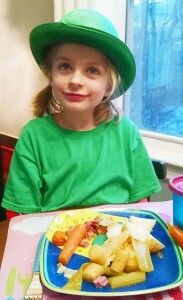 Are we Irish? What am I?” I noticed her voice rising and saw she was genuinely upset not to know the answers. And suddenly I remembered that feeling, when I was her age, of yearning to be part of something bigger than myself, of anchoring myself in a network of ancestors, of ethnic tradition and identity. To a little kid, knowing family history makes the incomprehensible weight and complexity of the past seem manageable—this is my family, which stretches back through time, and I’m part of a long line of people like me. And looking at her sweet, eager face I realized I wanted that too — I yearned for that connection with my ancestors, all the people who struggled and rejoiced and married and died to create me and my beloved little ones. So I promised my daughter then and there that I’d find out about our family, and I’d tell her all about it. And that’s how, at a publications team meeting, I found myself volunteering to write a series of blog posts on getting started in genealogy. Now I absolutely have to follow through, no excuses this time. Luckily, I’m surrounded by experts, so I knew just where to go to get help. Do the Ancestry spit in the tube DNA for a quickish answer to am I Irish! It lacks the “flesh and bones” of true record but is fascinating. I knew that I was about a quarter Irish with the English, German and French filling out the rest. I assumed all those English ancestors were not Irish. LO! 51% are from Ireland! Now to root out the irish colleens who caught the hearts of some Englishmen!! My recommendation as well …. I did my ancestral composition through “23 and ME ” DNA “spiting”…. a bargain at $99.00. Got a lot of very interesting health information as well. But with the FDA recently intervening here—- probably genetic screening politics—- much of this has now been stopped. However I also wanted to find out who I really was —- rather than that based on family myths. One of the biggest ones was that since my grandmother from Maine , looked very dark … she had to be other than her claimed Irish / Scots and English heritage. It was even speculated that her own grandmother was full blooded Indian. My “spit analysis going back 500 years”- however revealed nothing but European and mostly, as I knew, British and Irish; some German (as I knew) but I found out to my total surprise that I am as much French as I am German (wow !) and a little bit of Norwegian and Dutch. But nothing else – no Eastern European (ruling out any Jewish heritage that I should be concerned about – health wise), no Asian, American Indian, no African, etc. It even gave me an estimate of my per – human Neanderthal DNA, 3.1 %. If you decide on this – it would be a great way to “look for surprises”. I remember that exact moment when I had to find out more about my family! Fortunately, a few days later I was walking by NEHGS, took one of the brochures in front, went to a Marie Daley-led tour, and became a member. Now I have some answers and more complex questions. Genealogy is the gift that keeps on giving. I think having children often launches the search for family history – wanting to know from where you and now they came – what and who makes you who you are. I always knew I was half Norwegian, though my mother’s immigrant family. And we had a lot of talk around the dinner table, on long drives, and at family reunions about where we came from. In second grade, a school assignment was “Find out what your ancestors were.” I asked my dad, and I remember his answer, right off the top of his head. “You’re half Norwegian, 1/8 Scots-Irish, 1/8 Pennsylvania-Dutch, and 1/4 English.” He even helped me make a pie chart! That got me extra credit. And for years I was satisfied with his answer. When I started doing my own research, a lot of it turned out to be, not wrong, but way too simplified. I’m half-and-a-smidge Norwegian, for instance, through a Norwegian merchant who went to Holland ca. 1600, thence to New Netherland, where he married into one of my Dutch lines, which my father didn’t know about. But it was more than good enough for a second grader, and a lot more than most of my classmates (or their parents) could come up with. It will be fun to follow your journey, with all the resources you have at hand! Have a good time, and may your daughter enjoy the journey with you–and your little one too, in time. That is about when I wanted to know who we were. My Mom’s answer, since she had no idea, was that we are American. Then when pushed further, she replied Hienz 57 variety, a family term used to identify “mutt” dogs. I sure didn’t want to be that! So I’ve been working for years to find out who we are. I’m looking forward to your blog. When I was 15, my grandfather handed me a big sheet of paper on which his cousin, a good genealogist, had mapped out our line from Grandpa to William Brewster. There were a few wives written in when necessary, but no dates or places other than the Civil War and the Revolutionary War written next to two names. So that’s how I taught myself some basic genealogy. That was about 1970, when one had to write for records and wait for the mailman to bring those treasures, when we tried to locate the eldest maiden aunt who knew all the dirt and write letters back and forth, order unindexed records on microfilm and go near blind trying to read them, and when we kept a file drawer full of index cards with info on each ancestor, in an attempt to cross-reference them. I knew when I got the “right answer” when finding the next generation back, by referring to the chart, but now I could fill in those dates and places, the inlaws, and with more recent generations, lots of good stories and photos. It’s funny–and you’ll find this out in your searching–once someone learns that you’re family, their whole attitude and demeanor changes. Don’t know how to explain the feeling, exactly, but you’ll know what I mean when it happens. It’s such a warm feeling, like being welcomed to where you belong and didn’t know it. I made a lot of friends with various cousins, but they were always decades older than I and our friendships ended with age. Another feeling you’ll have that cant be beat: when you find your so-many-greats-grandfather was right there when Burgoyne surrendered, or was the legendary girl who first stepped onto Plymouth Rock, or that he ran a paddleboat up and down the Mississippi…history suddenly becomes a real thing to you. And to your children! That’s fun, telling them those stories, and they become more interested in history. Great to watch. I’m an analog girl in the digital age, I must admit, but when PCs came in, I was thrilled to be able to cross-reference so many things with spreadsheets. And the internet! things that used to take months or years happen in moments. I kind of miss the thrill of finally finding an ancestor after scrolling thru many microfilm strips or waiting for weeks to get pension records in the mail. Most of all, tho, I miss all of those sweet, warm women who’d reached the age where “I don’t buy green bananas any more”, as one told me. I have one last cousin left like that, but she’s 92, so…..
At any rate, I’m SO excited for you! Cant wait to hear about all of your discoveries. I do so hope you’ll have as wonderful experiences as I have—and am still having, even tho now I’m the eldest member left in my family. Now I can be the story teller! And so can you! I cant wait to hear yours! The best of luck! It’s an adventure that never ends. Thank you all for your kind and supportive words!